While most of South Florida's condominium communities were financially devastated by the downturn in the real estate market, one community did surprisingly well. In fact, several of the owners at The Reserve of Pinecrest are actually pre-paid by a month or two in their maintenance fees. Prices for both purchase and lease/rental are increasing rapidly in this stable complex. 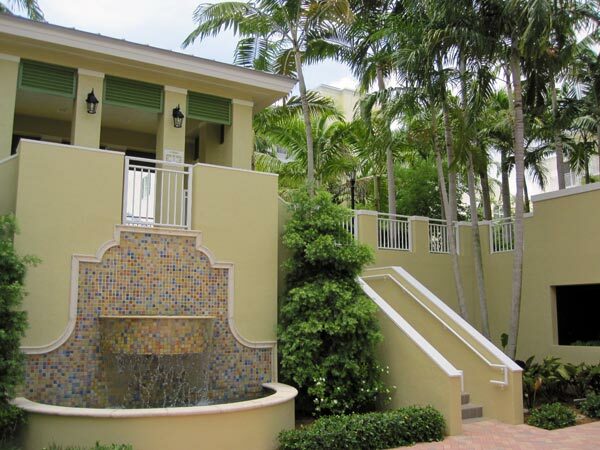 Built in 2003, The Reserve of Pinecrest Condo is a 68-unit condominium located in Pinecrest, Florida. Comprised of three and four bedroom condos (ranging from 1,738 to 2,226 square feet), the complex is luxury, but not over-the-top luxury...providing reasonable accommodations accompanied by reasonable maintenance fees. The units at The Reserve of Pinecrest are very nice; they have upscale kitchens with cherry wood cabinets and granite countertops, elegant baths, large balconies (front patios too, larger for 1st floor units - see below), impact glass windows, and elevators from the secured underground covered parking garage. There is an on-site gym, clubhouse and a beautiful sparkling pool and whirlpool, meticulously maintained, of course. Nestled on 102nd Street, right off of US-1, the complex is surprisingly quiet. 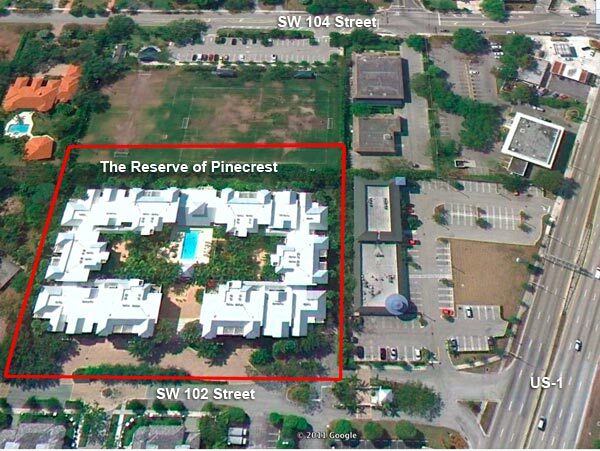 Behind The Reserve of Pinecrest is Pinecrest's newest park which hosts soccer fields. Close to the entrance of the Palmetto Expressway (826), grocery shopping, the Dadeland Mall and other shopping. The condo also has the best of schools: Pinecrest Elementary, Palmetto Middle and High Schools. What is most striking to me are the beautifully landscaped grounds. There is always some sort of very proactive preventative maintenance going on. Right now, the entire complex is being repainted, despite the original paint job not really showing significant wear. About two years ago, the community fired the off-site management company and found an internal resource to effectively manage from within. The Schuitema Group is now the management company and it is evident that they take every detail of condo lifestyle into consideration in their daily dedication. I am very familiar with The Reserve of Pinecrest because my parents live there and have for about 6 years. I know the rental and sales markets are strong. Prices are regularly a few notches higher than comparable condos. Most renters also renew for additional years. So, if you are looking for a hassle-free condo experience with "good sense" amenities, look no further. Give me a call and we'll explore options. Rentals start at around $3000 for 3BR and purchases at $400k.